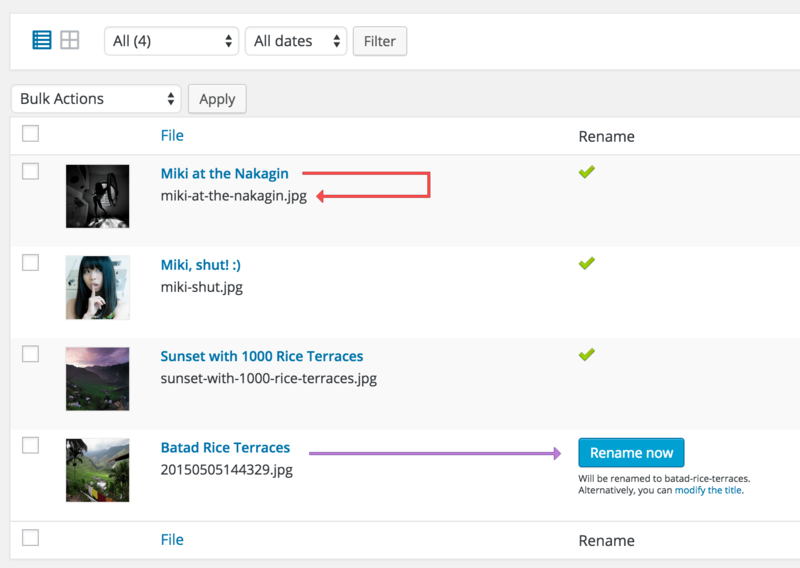 Media File Renamer is a WordPress plugin that renames your media files. It can be automatic (depending on certain conditions) or manual. It is excellent for SEO, to keep your WordPress tidy and to avoid issues related to files. The references to those filenames on your website will also be updated. It has many features, and if you are a developer you can automate the whole process and how the renaming is performed. A new column in the Media Library will be displayed. By default, Media File Renamer recommends you an ideal filename based on the title of this media. The Pro version was created almost two years after the first release of the Free version. It adds requested features, such as the Manual Rename. You can edit the filenames of your Media directly, through the Media Edit screen or through the Media Library. If you are interested all the files at once, you can do it through the dashboard of Media File Renamer. Renaming files in WordPress is a dangerous process. Prepare a backup first (BlogVault is recommended), then rename a few files first. Check if everything is working fine. I recommend you to use the default options. Then to use manual renaming for special cases or when titles are too similar. If you need to customize your renaming, you can 🙂 There are many filers and actions you can use. Have a look at FAQ & Issues.